The rate at which crossbow hunting is becoming popular in the United States is something to be reckoned with, and for you to have a successful hunt, you need a nice scope on a perfect crossbow. It is essential to acquire a standard scope with a crossbow that is why we are here to help you make the right choice when buying. You will also get to know how far can a crossbow shoot. There is a popular saying in the military environment that it is the person behind the firearm that matters. For hunters, they believe that a crossbow is an amazing hunting tool, but is just as good as the scope that is mounted on it. On this note, you need a crossbow scope and you need to carefully examine it to ensure that it is suitable for your toy. If you want to have a wonderful hunting experience, you need a state of the art scope that matches a high-performance crossbow perfectly. With a substandard scope, it will be quite easy for the projectiles to miss the targets. There are a variety of scopes available on the marketplace today which makes it difficult to choose the right one. There are some key features you need to check out if you truly want to buy a perfect sight. Of all the features, the most important feature that makes a perfect scope is bright optics. Other things to look out for include magnification levels, styles & design, etc. When reading the model of a scope, the first number on it describe its magnification. For example, if a scope reads 6 x 32, it means that it magnifies the image 4x than what you can see with your naked eye. Owning a scope with a higher magnification gives you the opportunity to zoom in from a far distance, but this may lead to less clarity. It is the distance between the eyepiece lens and your shooting eye. A scope that has good eye relief will create ample room between the lens and your eye. Purchasing a scope that has a poor eye relief may lead to hitting your eye on the lens when the arrow is released from the crossbow. From the example given under magnification, the second number there is the objective lens diameter and it is measured in millimeter (mm). This feature helps to determine the aperture or exit pupil of the lens – this means that it helps in determining the amount of light that will reach your eye when you look through the scope. A perfect scope should be waterproof, fog proof, and dustproof. With these qualities, you can use your scope in any harsh environment without any fear of it breaking down. To enhance clarity, it is recommended that you go for a scope with fog proof lens. This feature is mostly seen inexpensive scopes. It helps to control the amount of unwanted light entering the lens, thus maximizing clarity. With this feature, you can shoot in areas with low light. The image becomes bright when the light is taken in through the scope. Crossbow scope with a built-in rangefinder is the best choice here. The reticle shows you the trajectory of your arrow. This feature helps you to aim at your target. Here is another great crossbow scope that is known for its ruggedness. It has the ability to withstand tough environmental conditions which makes it preferred by most hunters. It has a velocity adjustment wheel of between 300 and 400FPS, which is a little lower than the 400+ FPS of today’s scopes. The Twilight DLX has an excellent reticle that can shoot up to 60 yards. The light transmission of this scope is arguably the best you can get in the market, thanks to its fully multi-coated optics. Also, the eye relief is comfortable to use. This is one of the crossbow scopes with rangefinder built in. It comes with an amazing 5 aiming dots, illuminated, with a rangefinder. The reticles are powerful enough to aim up to 100 yards which make it one of the best to get on the marketplace. With 5 degrees of brightness on this scope, it allows green or red illumination, and it functions perfectly even in areas where there is low light. With a waterproof, fog proof, and shockproof lens, you can use the scope in any conditions without the fear of it breaking down. The lens is fully multicoated with eleven layers of anti-reflective coatings. This means the excellent light transmission and superb clarity. Nikon has been in the industry for some time now and they are known for their high-quality optics. The Bolt XR offers superb eye relief and multiple reticles for comfortable shooting. 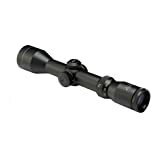 It comes with a 3X magnification and the reticle can aim points from 20 yards – 60 yards. 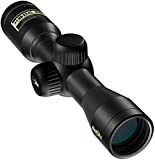 The lens on this scope is clear and crisp, and it has fog proof and weatherproof qualities which makes it suitable for harsh environmental conditions. Unfortunately, the reticles are not illuminated but have an excellent light transmission coming in at 92%. It is a wonderful experience hunting with the crossbow, but to make it perfect, you need a scope to complement it. The list of crossbow scopes given above will help you out when next you are going for hunting. Choosing any one of them will serve you just fine.